Well over 100 million Small Block Chevrolet engines have rolled off General Motors assembly lines since it was first introduced in 1955. The current LS/LT engines are much different than the engine introduced 60 years ago, however they utilize the same basic formula as the original SBC motor, a testament to its greatness. 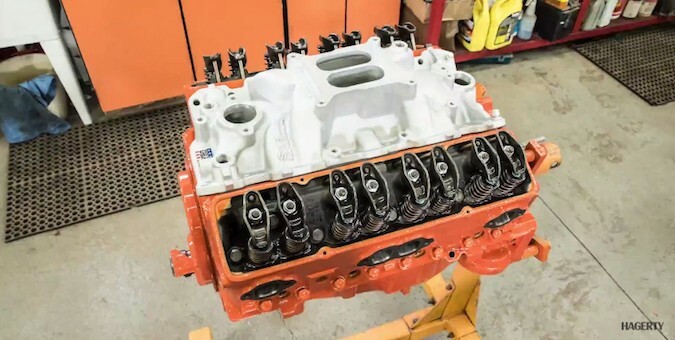 To celebrate 60 years of Small Block Chevy power, Hagerty Classic Cars ripped apart a well-used Chevy V8, cleaned it up a bit and gave it a slight makeover with some orange paint and an Edelbrock carb and intake. They also filmed the process and put it on a time lapse, allowing us to watch it from beginning to end in just under four minutes. The chances that you have some sort of story or tale involving a Small Block Motor are pretty high, considering they’ve powered everything from pickup trucks to wakeboarding boats. Pay your respects on its birthday and by watching the short video below and join us in hoping for another 60 years of Small Block. Previous story Could The Mid Engine Corvette Actually Be A Cadillac? The current LS isn’t a Chevy at all. It’s a GM/GMC corporate engine. I just love how chevy likes to hijack anything V8 after 1997 and try to claim it as theirs. Their V8 engine ceased production in 96/97. GM put the new and far improved GM/GMC V8 into the GM Corvette and GM trucks after that. The chevy marketing arm of GM/GMC still cries themselves to sleep over this fact along with old chevrolet lovers. And good riddance to sbc’s. I laughed when the C5 came out with a GM engine and not a sbc or bbc. Chevy tried to call it a gen 3 smallblock. lol!! As a Pontiac man, I threw darts at bowties all night long and drank beer. It was party time since chevy got what they had comin to em. They shoved their junk sbc’s into our Pontiac’s all through the 80’s and early 90’s. Now they have someone else shoving Their engines into chevy’s. A taste of their own medicine! I didn’t like Buick shoving their engines down our throats either in the Grand Prix either to be fair. It wasn’t nearly as bad as the chevy still since they killed our Pontiac v8 engine division. Then chevy got their Own engine division killed by GM or GMC! Karma baby! The LS’s (mk1 and mk2) are gone. It’s a mk2 LT’s now. We all know that’s wrong. The mk2 LT’s are hardly 3 years old at most. If people point out “pushrods” as some kind of throwback to the 50’s, then it can be equally said that overhead cams, which predate overhead valves by almost 30 years, are more archaic than pushrods and are worthy of ridicule. With the SBC dead, any weight to the argument that pushrods are dated died with it. With the mk1 LT and both LS’s gone, it only further bury’s the already weak argument. As for the current LT’s, the more they prove how remarkable they are in their operation and performance potential, the better marketability Chevrolet’s performance products are. You better not be that loser on GMI who calls the Chevrolet Corvette the “GM Corvette”, because I don’t think you’ll have much success convincing the world that the Corvette is anything other than a Chevrolet. It’s the same reason I know you won’t dare call the Mercedes S-class the “Daimler AG S-class” because I know you can’t convince others of that kind of mindset. It’s a shortsighted and foolhardy grudge you’re holding against GM for the way it operated 50 years ago; never being able to reconcile the fact that the division all folded because they were unprofitable and redundant. I don’t know about the engine stuff but I do know you just pointed out that the divisions were all folded because they were unprofitable and redundant. That goes to the op’s point that the Corvette really is a GM Corvette. You made his point. Everything really is all just GM now. The individual companies or divisions were folded. It all became One GM post 1984. Chevrolet isn’t real. It’s just like everything they have closed or still have ie: Chevrolet, Buick, Cadillac, Holden. All are just marketing channels. Nothing more, nothing less. GM only keeps those names to cash in on old loyal customers from those companies or divisions. Most people aren’t loyal to GM save for some GMC buyers. I think they’re in it for the Denali though. I’ll always call the Corvette a Chevrolet, even if it technically isn’t any longer. Man why all the hate for the good old Small Block? While I think the new engines are great the old SBC is still the backbone of the speed industry and will be for decades. It is a much simpler design for a guy like me to take apart and reassemble in ones garage. Just enjoy it, it’s not going anywhere.